Lower Thames Crossing team have had political engagement in February 2018 included a briefing with Councillors from Little Thurrock & Blackshots Ward, and meetings with Brentwood Borough Council, Sir David Amess MP‘s team, Sir Michael Fallon MP, and Thurrock Council. Have they met with Basildon Borough Council? LOWER THAMES CROSSING – Decision Made. ‘Running from M25 near North Ockendon; crossing A13 at Orsett; north of Chadwell St. Mary; before reaching the Kent bound tunnel in East Tilbury. Running east of Gravesend joining the A2. a bored tunnel crossing under the River Thames east of Gravesend and Tilbury (Location C) A Two mile Toll tunnel. NOTE: Consultation closed on Thursday 24 March 2016. The Tolls of the Dartford River Crossing, will assist in paying for this new route. For many yeears the profits have been used for major road projects, mainly in Kent. There were 3 Lower Thames Options and the one that would adversely affect the A127 has been discounted. Highways England say Route 3 is preferred. Informed Jim Osullivan, CEO, now in charge of Highways England. Should it be 2 or 4 lanes each way (If 2 then will they need to increase)! 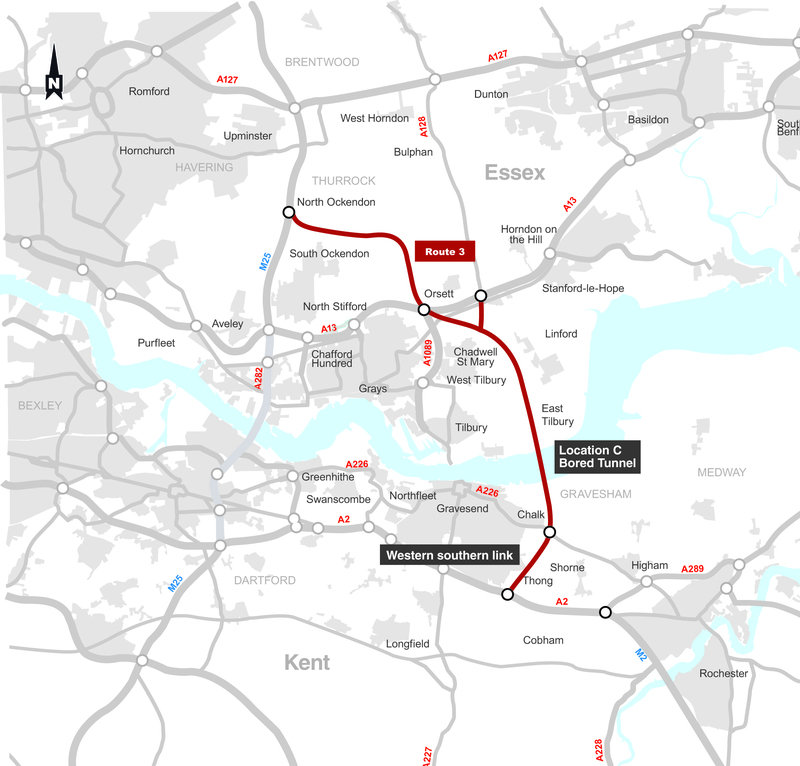 Look at Dartford started as two 2 lane Tunnels, then built QEII Bridge so could have 4 lanes each way (which allows for maintenance by either closing one tunnel, part of or all of bridge at off peak times). View the consultation booklet (6MB PDF).